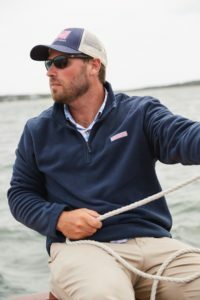 Captain Kurt Peterson grew up on a catboat and spent his childhood sailing to local islands like Cuttyhunk, Martha’s Vineyard, and Nantucket. He has sailed the East Coast from Maine to Key West. 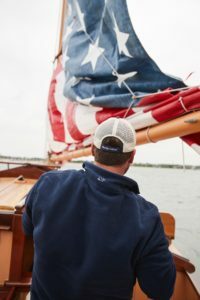 In April 2016, he purchased the ninety-year-old catboat, “Tigress,” after a meticulous restoration by Roger Fuller and Tom Townsend in Mystic, CT. Tigress’s sail was hand-painted by Kurt and a couple of his closest friends. 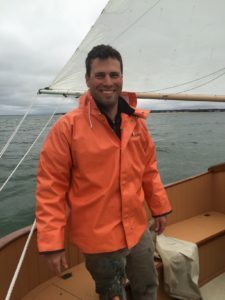 Before starting Catboat Charters in 2015, he worked as a private captain, an innkeeper, and as a renewable energy project manager. He also paints American maritime scenes and will occasionally play guitar and sing for his charter guests. He now lives full time on Martha’s Vineyard and continues to fall deeper in love with the island and its people each day. Kurt attended Wheaton College where he studied art and music, and he holds a USCG 50 ton license with an Auxiliary Sail endorsement. Kurt is extremely grateful to his loyal friends and patrons for making this all possible.